Are you familiar with unit studies? Do you just love using unit studies in your classroom or at home with your children? I have never used a literature unit study before, either as a teacher in my public school classroom (4th grade) or at home with my two children. Are you shocked? Well, I must say in defense of myself that we have mostly used a literature approach to teaching history, along with another curriculum program for history that encourages that type of learning. And, we did read children’s books when the girls were little and often did some cute crafts and activities to go along with the books. We’re a family of readers…all bookworms, so we read a lot. Every time we hop in the car to go somewhere, even only 5-10 minutes away, the girls run and select a book to take with them in the car before they will even think of getting their shoes and coats! And in the public school system, the pressure to get children (dare I say, "force" children?) to read well is so high that it can be hard to make time for something fun to encourage reading. Maybe that's why summer reading programs exist at libraries, I suppose! So, in reality, I guess we’ve done a teeny bit of unit studies over the years, but nothing that I’ve ever had much time to design myself. But the thought of me trying to take a children’s chapter book, and attempting to turn it into a unit study, has always freaked me out. I know I COULD do it, and would actually enjoy writing a unit study, but…my children would have to be shipped out for a week to someone else so I could work DURING THE DAYTIME when my brain is fully awake, with NO distractions. Since that isn’t going to happen anytime soon, I won’t be designing my own unit studies anytime soon, either! 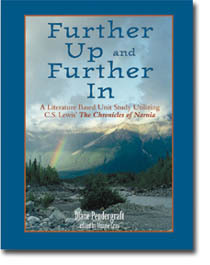 I was excited to be selected to receive a copy of Further Up and Further In, a literature-based unit study that utilizes C.S. Lewis’ The Chronicles of Narnia book series. I really like the fact that the main focus of the author is to have its users really get into studying the Word of God, the Bible! The author also states that Further Up and Further In "is a well-rounded scholastic program needing only math, grammar, and spelling curricula to complete the student’s course work." Supply list of the items I would need for that section if I was going to do every activity suggested in those four chapters. As we worked through the first section of this literature guide, which covers The Magician’s Nephew, I found that the vocabulary sections for most of the chapters were adequate for this age group. Some of the chapters had only 1-3 vocabulary words, while others had 10-12 words. My girls didn’t mind looking up the words in our dictionary, and they actually enjoyed learning how to do citations as is required occasionally for some of the vocabulary words. After completing the vocabulary sections, we would read the accompanying chapter in The Magician’s Nephew. Since my children typically read books in several hours, this was the only feature they found that they didn’t like as well: being forced to read 1-3 chapters per week instead of 1-3 books per week! Then….the activities! There are so many activities to choose from for each chapter! The variety is wonderful. We found that some chapters of the Narnia books had fewer activities written to go along with the chapters, but that was fine with us. It enabled us to move more quickly through the book, which thrilled my children. We have also liked the comprehension and critical thinking questions that accompany each chapter. The activities also reach out to a variety of learning styles, even for the active, hands-on child. Very well done! I especially liked the Bible study that accompanies most of the chapters. It is well thought out and I could see it producing more godly character qualities in my children. I do want to add here at the end of this review, however, that while this book claims to cover history and science adequately, I feel differently. If I consider this as mainly a literature unit study, I will be satisfied with the smattering of history and science contained within Further Up and Further In. If you are wanting a unit study that dives deeply into science and history, then you may need to do some additional work on your own to accomplish that task. I feel like I need to give you an example from the book, so you’ll understand what I mean. In chapter 2 of The Magician’s Nephew, Uncle Andrew tells us that there are worlds that can never be reached by traveling through space. In Further Up and Further In, the author states on page 16, "We do not know this for sure, but we can find out how far the other planets in our solar system are from earth. How far away is the nearest planet? The farthest? How far away is the nearest galaxy? How long would it take us to get there?" In my mind, if this was a unit study that more fully covered science concepts, it would have included some additional reading, worksheets, and activities that would have covered the planets and outer space. Of course, a parent or teacher is able to add in whatever books, materials, and activities he or she wants to study the planets and outer space, but it would have been nice to see those kinds of suggestions already developed for the parent or teacher. Just keep in mind that this unit study contains a smattering of science, not a full-fledged science curriculum. You’ll want to include your own materials to more adequately cover science topics, if desired. The author’s website, www.CadronCreek.com, additionally contains internet research links for the three main literature study programs that they sell, which is helpful. They also maintain a Yahoo group for each of the three programs. www.CadronCreek.com sells Further Up and Further In for $56, or $61 if you would prefer the spiral edition. This was also one of Cathy Duffy's "100 Top Picks!" My girls and I have really enjoyed using Further Up and Further In. We look forward to working through the remainder of the book in the future. 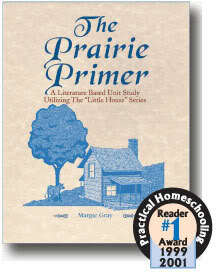 Experience the Pioneer Era as you explore all nine of the Little House on the Prairie books. The award-winning literature-based unit study, The Prairie Primer, is a ticket to adventure for third through sixth graders. With this interdisciplinary approach,they make butter, analyze owl pellets, watch muzzle loading guns being fired, study the grizzly and learn about animal classification. As they encounter life on the frontier with the Ingalls family, students are challenged to grow in character and wisdom. 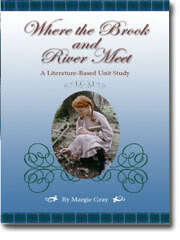 From the practical to the poetic, students of Where the Brook and River Meet journey through the Victorian Era and the world of Anne of Green Gables. Through varied, thought-provoking activities that stimulate interest as well as inquiry, junior high and high school girls explore the events andculture of this unique time in history. DISCLOSURE: While I will never be paid to write a product review (gasp! ), I did accept a free copy of Further Up and Further In for me to use in our home and then write an unbiased review.